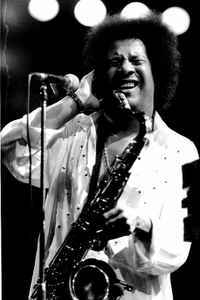 James Senese is an italian saxman who became famous in the ’60s with a band called “the Showmen”. In the ’70s he became internationally famous playing in a jazz-rock band called Napoli Centrale which involved some other artists as Tony Walmsley, Mark Harris, Franco Del Prete and Pino Daniele. Since the ’80s he has been playing as a solo or cooperating with other singers and musicians as Gil Evans, Roberto De Simone and the Art Ensemble of Chicago. His masterpieces are: “Napoli Centrale”, “Mattanza”, “Qualcosa ca nu’mmore”, “Hey James”. Here’s a quote from his biography “Je sto ccà” written by Carmine Aymone: “I was born as a blackman and I was born in Miano, I play sax, I play it half way between Naples and Bronx, I study John Coltrane all day long, I fell in love with Miles Davis and Weather Report and I always create by instinct, trying to find a language of my own, never imitating. My Sax bears the scars of life’s joy and sorrow. James Senese Chi Ha Rubato La Mia Rolls Royce?